IKO Kyokushinkaikan founder Sosai Masutatsu Oyama's 22nd memorial service was held at the Mt.Mitsumine Shrine in the Saitama Pref. on Monday, April 18, the day after the 2016 International Karate Friendship. 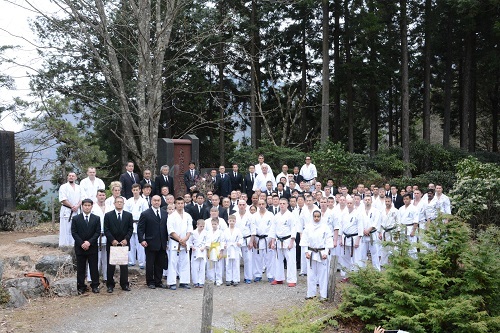 Approximately 200 members took part in this memorial service which included IKO President Kancho Shokei Matsui, Shihan Yuzo Goda, Shihan Peter Chong, Shihan Kenny Uytenbogaardt, Shihan Masatoshi Yamada, Shihan Katsuhito Gorai, Shihan Stuart Corrigal, Shihan Francisco Filho, IKO officials, Branch Chiefs from all over Japan and overseas, fighters who participated in the IFT, International Training Camp participants and headquarter staff. 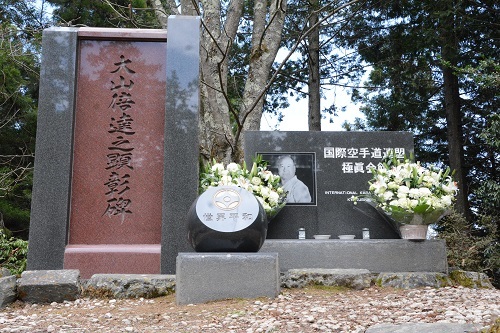 Participants together gave prayers to the founder of Kyokushin karate. The memorial sevice started with a prayer Shinto style then members moved to the "Soreisha" where Sosai Oyama's spirit rest and finished by paying respect to Sosai's Monument.